We’re pleased to share a couple of brief and minor updates to our collection of Developer APIs. We now recommend using HTTPS for all of our APIs. We’ve updated our documentation to reflect this. Most of our JSON APIs still support HTTP. Some of our APIs now return a 301 redirect from the HTTP version to the HTTPS version. We implemented some simplistic rate-limiting to throttle clients who are sending too many API queries. You may receive a 429 “Too Many Requests” error if your client makes more than 90 requests in a 10-second window. Remember, this is a free service; please be polite and send batch API requests slowly over a longer period of time. 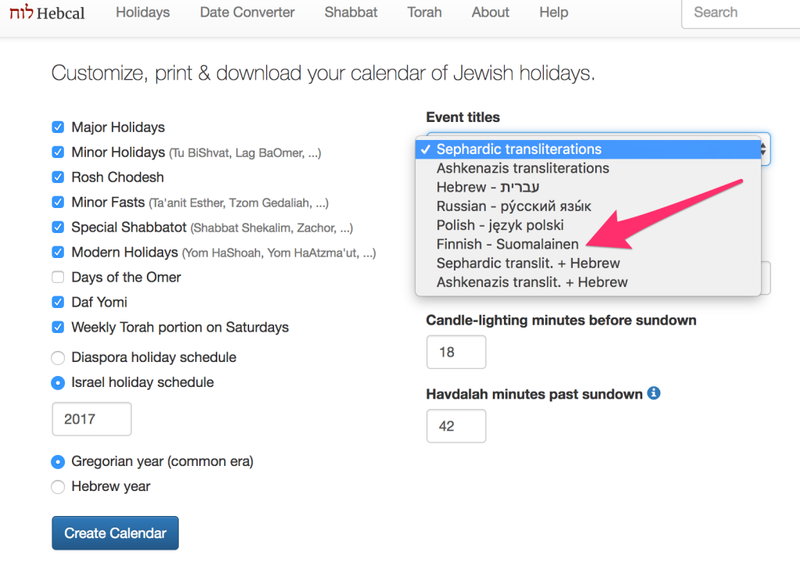 We’re pleased to offer support for French transliterations of holidays and other event titles, courtesy Marc Neiger. To use the new feature, go to https://www.hebcal.com/hebcal/ and select French – français from the Event titles drop-down menu, then click on Create Calendar. We’re pleased to offer support for Finnish transliterations of holidays and other event titles, courtesy Petteri Hjort. To use the new feature, go to https://www.hebcal.com/hebcal/ and select Finnish – Soumalainen from the Event titles drop-down menu, then click on Create Calendar. As many have noted, the first day of Chanukah coincided with Christmas this year (December 25, 2016). This happens approximately three times each century. Prior to this year, the most recent occurrence was in 1978, and the next time this will happen will be in 2027.